This site is aimed at supporting the continuing professional development (CPD) of health professionals working with children. It is put together by a UK general paediatric consultant ably assisted and kept on her toes by bright-eyed, enthusiastic registrars (paediatricians in training) who ask questions the majority of which she can’t possibly answer without consulting the evidence-base. Disclaimer: We work very hard to check the evidence for all the topics we write about but, like anyone else, we can make mistakes and medical evidence is continually updated. I take no responsibility for any decisions you may make by blindly following anything written here. We offer it all as food for thought only; feel free to add your comments. March 2018: NICE on antimicrobial prescribing for cystitis this month, CAP (we need to reduce the investigtions), heart murmurs in unwell children, carotenaemia and part 2 of Medically Unexplained Symptoms. Please leave comments, questions or suggestions on the blog. Dear Julia, thank you for posting our childhood cancer awareness card from the Grace Kelly Ladybird Trust. I can now confirm that 3 children have been diagnosed directly as a result of our cards in as many months. If any paediatricians , GPs or A&E doctors would like card copies to give out (55% of cases present as an emergency) they can email the email below. Thanks so much. The were done combining NICE and Sign guidance. Hi, good to get the message out there about limp and ALL (March 2017 newsletter). I would talk about limp or ‘off legs’ due to limb pains as many kids just start using the buggy again or being reluctant to walk but may not limp. Red flags include any pain waking a child at night or progressing. If 2 cell lines affected in FBC they should be discussed with the on call paediatric registrar and seen the same day as it’s malignant until proven otherwise. Also you can still have leukaemia or lymphoma with normal looking blood counts until there is bone marrow failure so there should be safety netting if things are not improving. Is Paediatric Pearls recognised by the RCPCH for paediatric CPD? I don’t know! I’ve never asked them. Maybe I should. I think you can always get CPD points for reflection on your learning if you think that Paediatric Pearls falls into that sort of category. A colleague has pointed out your site to me and this query specifically. While I’m replying a while after the post was submitted, I hope this is helpful. Julia let me know about this helpful site so that I could update you on the new integrated drugs and alcohol service for the London Borough of Waltham Forest, called Lifeline Waltham Forest. It’s an over 18 service, but we use a whole family approach which means that as well as working with families and carers, we also involve the family in the recovery and change process. We also run parenting support groups and family outings. The service opened on 1st August 2015 and the Borough’s other drugs and alcohol services closed down. However, the 722 Young People’s Substance Misuse Service is still running and can be contacted on 0300 555 1158. There’s a lot more information on our website – http://www.lifelinewalthamforest.org.uk – or do give the service a call if you would like to find out more on 020 3826 9600. It has been many years since we met at an Enuresis conference and you offered to post my enuresis program on your site. Since then I have gone on to win the BJN Nurse of the year for my enuresis work. I am looking for opportunities to move this project forward. Please let me know if you or anyone you know might be interested in having a chat. Hi Paul, I am a paediatrician with sub specialist interest in uro- nephrology, and a vast majority of my work includes complex primary and secondary enuresis. I would like to know if I could liaise with you in any way. excellent October article- as usual. I wanted to ask you about the role of monteleukast in the management of recurrent viral induced wheeze in infants and young children. We are seeing this increasingly prescribed for the prevention of deterioration- very often patients are asked to take it at the onset on their symptoms. It seems to be very effective in controlling symptoms. Is this something that could be prescribed more widely in children who are having recurrent viral wheeze, who are requiring prednisolone and having to attend A&E often?. Please see November 2014’s newsletter for comments on the recently published WAIT study which looks at the use of montelukast in viral induced wheezers. Not really a magic pill (granules actually) but some of us still cling on to the hope that it might prove to be in certain children with the right genes. I was lovely to meet with you. Thank you for hosting our Barnet pathways. I look forward to sharing more. Your website is fantastic- I will definitely be spreading the word. Pls could I be added to your mailing list too. Dear Julia- thaks for the excellent, useful resource! Using it a lot on my paeds ED placement- could I please be added to your mailing list? I saw this website incidently , found it quite interesting. First of all, I would like to congratulate you for the fantastic web page, which I find it very useful and informative, in addition to that it is very important to discuss, reflect and bring to light very important scientific issues that might positively affect our future management and treatment for various diseases and you just opened this window. I am involved in research, specially metabolism, and cardiovascular related physiology and pathology. From my reading through various official medical governmental web pages (Local and international), medical text books (Local and international) medical education (Medical Schools), among doctors, scientists and even patients, I noticed that they all strongly believe that type 1 diabetics have zero insulin levels in their body or blood, and that because their beta cells in the pancreas are destroyed by either viruses or antibodies or chemicals or autoimmune or any other unknown reasons. I quote her some examples for such statements with their sources references (In type 1 diabetes, the pancreas (a small gland behind the stomach) does not produce any insulin. Insulin is a hormone that regulates blood glucose levels.- http://www.nhs.uk/Conditions/Diabetes-type1/Pages/Introduction.aspx), another example (Type 1 diabetes develops when the body’s immune system attacks and destroys the cells that produce insulin. As a result the body is unable to produce insulin and this leads to increased blood glucose levels, which in turn can cause serious damage to all organ systems in the body.- http://www.diabetes.org.uk/Guide-to-diabetes/Type-1-diabetes/). I have previously done research (abroad) on more than 132 diabetic patients with both type 1 and type 2 diabetes and my results showed that no patient had zero insulin level (normal range 3 to 27 international units), only one case showed insulin levels of 2 iu; some type 1 patients had low C peptides with normal insulin levels and high blood glucose levels and others had normal C peptide with normal insulin levels and high blood glucose levels. As you know that insulin is a hormone secreted by pancreas and other tissues directly into the blood, similarly thyroid hormones are secreted by thyroid glands directly into the blood, and from our medical practice we normally check for example thyroid hormones levels and if they low we top up and if high we lower them to levels with medications, and we use this procedure for other hormones except for insulin. My question is this: is there any reason why we do not check insulin levels and treat accordingly? And my second question is: is there any scientific paper, published or unpublished to support, confirm or prove the above mentioned statements by diabetes.org.uk and nhs.uk, that zero insulin were found in all type 1 diabetic patients or at least one, two or more diabetic patients? Brilliant, informative site. Please could you add me to your mailing list? as Gps we see lots of cases of viral wheeze. I would like some clarification on the use of prednisolone in such cases. In most cases we issue ventolin (unless bronchiolitis is suspected), but in those cases where the patient is working a bit harder we also issue prednisolone. I am not sure what the evidence says about the duration of treatment with steroids. I have seen anything from 3 days to 5 days treatment. How many days should we prescribe prednisolone for ? is it age dependant? Just another question on bronchiolitic wheeze. is any role of atrovent? I’ll tell you what I think – and we’ll see how many people disagree! There was a paper in the New England Journal of Medicine in 2009 that concluded that in pre-school children with mild-to-moderate wheezing associated with a viral infection, prednisolone was not superior to placebo. Primary outcome: duration of hospitalisation. Secondary outcomes: amount of β –agonist used, time to return to normal activities, number of readmissions in a month. The authors suggested we do NOT give oral prednisolone routinely to this group of patients. NEJM 2009;360(4):329-338. However if you look closely at the cohort they studied I think this same conclusion is not necessarily true for the wheezy preschoolers who have an obvious atopic history (eczema, allergies, family history of hay fever, asthma etc.). At Whipps we tend to try and hold off steroids if we are likely to send this age group home from the ED but give them if they are ill enough to be admitted or if we think they are atopic and likely to benefit from them. The BTS guideline on asthma (there is not one on “viral induced wheeze”) offers a range of days of treatment (3-5 days) (http://www.brit-thoracic.org.uk/guidelines/asthma-guidelines.aspx). Our policy is generally 5 days if they have been admitted though I personally sometimes give a 3 day course as a sort of half way house if I am not convinced they really need them anyway. I don’t think it is age dependant. ). Atrovent may be worth trying in the slightly older babies where you are beginning to wonder whether this is actually viral induced wheeze rather than bronchiolitis. Have a listen after you’ve given it and if it hasn’t made a difference it’s not worth continuing with it. Same goes if you are trying salbutamol in the older babies; they may not have enough of the right receptors yet to respond. If it doesn’t have an effect the first time you give it, it is not worth continuing with it. Clear as mud! Medicine as an art form…. I think your newsletters are great and very helpful! I was doing a search through past editions but didn’t come across anything unless I’ve missed it. I was wondering if there’s any tips for for childhood obesity and how we should be managing in GP and when we should be referring etc. I have stumbled upon your wonderful site recently, and have found it generally informative. I’m a nurse in paeds a&e. Just a little niggle, and only because in a previous life I did renal for a few years. In your june 2012 update about BP the guidelines state that the cuff should cover at least 40% of the circumfrence of the arm. This is ambiguous at best and is based on old adult guidelines that the width of the cuff should cover at least 40% of the circumfrence of the upper arm. It is much better to focus on the length of the bladder, and ideally this should cover the circumfrence of the arm- we have all had short fat children to do blood pressure on, and a bigger cuff would give a far more accurate BP than a shorter cuff would. If not 100% then it should be greater than 80%- there are a wide range of sizes available for our “growing” paediatric population. Perhaps it would be good also to mention that any abnormal reading on an automated reader should be repeated manually after 5 minutes. every year children are refered unnecessarily to a nephrology consultant because of high blood pressure which is found to be normal using correctly sized equipment. Thank you for your helpful clarification. Blood pressure is notoriously badly taken in children – if at all. I take it myself manually if the automated reading is high and will concentrate harder on the length of the bladder from now on! This website is amazing! Thank you for putting so much work and time into it. I’m not sure how I ended up finding it during a totally unrelated search but I’m really glad I did! Hope to see you later this week at PECSIG. PS: please add me to your mailing list. Thanks. This is quite a good website. Please can you add me to your email list. This website is brilliant. I’m not entirely sure how I found it! If there’s a mailing list around for people who receive the monthly digests or reminders to check here I’d love to be added on it…I always forget to check back on wesites regularly! Thank you for your kind comment. I will add you to my mailing list for the newsletters. You could follow us on Twitter too if you are into that sort of thing. I don’t tweet very often but do tend to say something when I have just uploaded a newsletter. Hope u r keeping well. Very useful PDF to refresh knowledge. Varus deformities in Rickets takes longer time to revert back to normal, so in such cases do we still have to rule out Blounts disease in children > 3yrs , who was previously diagnosed as vit D deficiency ?? Good to hear from you Radha. I hope India is suiting you. Interesting to see the pathology is similar in some ways! I am going to ask one of the paediatric orthopaedic surgeons at the Royal London Hospital to answer your question. It seems unfair that children should have both pathologies but if you are in an area of very high rickets prevalence then may be it is possible. It would be very bad luck for a child to have both rickets and Blount’s disease. Assuming the Ricketts is being treated, improvement in the defmormity can be expected although it may be slow. In contrast, Blounts tibia vara usually gets progressively worse. Perhaps observe the child for 3 or 4 months and see if they are getting better or worse. Radiologically the two conditions are very different and so an xray will almost certainly be able to differentiate the 2 conditions. If the varus deformity is secondary to ricketts, I would follow the child up until the limb alignment has corrected. If it is Blounts and getting worse, then referral to a paediatric orthopaedic surgeon would be appropriate. the neurodevelopment series is a very useful document for practitioners .esp useful to compare with normal children. thank u n Mr Barry for info on blounts vs rickets . Its always a pleasure reading articles from Paediatric Pearls. I find them very informative. I have a question. I have heard that oral prednisolone can also be used for croup (1mg/kg- if I remeber correctly). I have never seen this used. In the AE dept I worked in the past- we’ve always used dexamethasone. I am not sure how true this is. I would be gratfeul for your comment. The BNFc suggests that 1-2mg/kg prednisolone is appropriate to give in croup “prior to sending the child to hospital”. This would be easier to give/prescribe I think in general practice than the oral dexamethasone which comes in very large bottles. Either wears off after a while so our practice in the ED is to observe them for 2-3 hours post corticosteroid administration and if they present in the evening we tend to admit them overnight. The Cochrane work suggests that dexamethasone is less likely to lead to readmission than prednisolone. As far as corticosteroids in croup go, I’ve only ever used dexamethasone (and nebulised budesonide years ago which works but is more expensive than dex and no better). Julia, this is awesome. Thanks for getting in touch. It will become a prominent link on gp-training.net. Do keep going, and developing! Let me know if I can be of any help. Do get back in touch so we can converse. It was very pleasant to stumble upon this website,it is a very useful tool.I don’t know if you remember me but I was your SHO in Whipps Cross Hospital when you were registrar ,some where in 2000-2001 and have special memories of those days.I am now an attending Peaditrician in the US now .I will visit this site and stay in touch.This is really good. Thanks for your message William and good luck in the States. As you can see, I haven’t moved very far! Following our telephone conversation a few weeks ago about a patient, I have been looking at the website regularly. Really informative and practical advice. I’ll spread the word amongst my colleagues. Julia this is great, i find it better than a book in some ways, i hope you can continue with this & make a large e-library, i will recommend this to my own GP in enfield who was asking me questions yesterday when i visited him for my own problem. Also i like the idea that we can access this free from anywhere in the world. I’m sure with time you will find ways to make it even more user friendly. Well done. Julia, I think the website is fabulous. It’s informative, interesting and fun! Well done! I look forward to keeping updated with pearls. Brilliant! Thanks Anna and thank you for your professional dietetic input into the text box on infant formulas in October’s Paediatric Pearls. I didn’t know parents can use Nesquik as flavouring for the amino acid or extensively hydrolysed milks as an alternative to vanilla essence drops but I see there’s a whole discussion on Mumsnet on how to flavour your baby’s Nutramigen or Neocate! I am impressed with your effort and persistence. This is nice. You may consider how to directt he reader to the topics that they want to read. When I go to the website, I would probably want to read something that I dont know. Have you considered a list of keywords, which link to to specific editions? e.g. 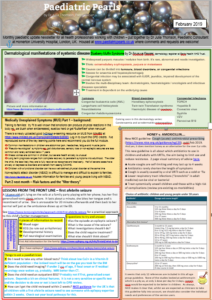 Tinea Capitis….’Click’ then go to the right section? These could become an ‘e-library’ and who knows, you may find a nice publisher to publish it! Ashraf is quite keen to collect cases, get students, or SHO to write them up. Maybe something you can consider with the paediatricpearls. Thank you John. There is a tag cloud on the right which admittedly looks like a jumble of random words in random fonts but will actually provide the search you were suggesting. The size of the word reflects how many times it has been tagged on the site. I need to tidy that section up a bit. There is also a search function at the top right. I like the idea of case histories; they could just go into the blog bit as comments linked to a topic we’ve featured. Amutha is at the moment trying to get the SHOs involved in a “6 week check” series for the GPs so I’ll get them to do that first if I may.